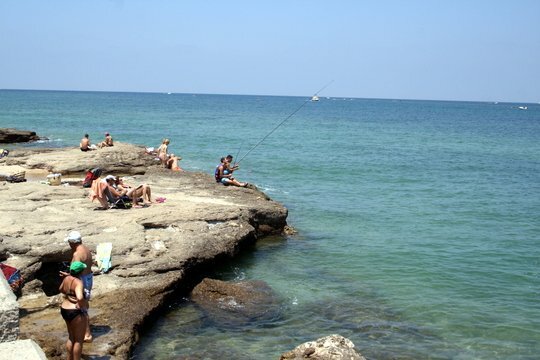 Fishing at La Caleta in Cadiz. I remember the first time I looked up Ale’s hometown. 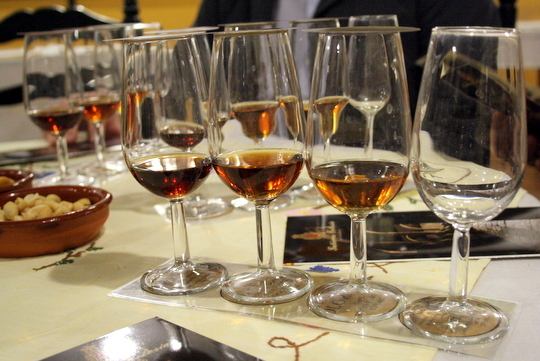 He had told me that he was from a small town called El Puerto de Santa María in Cadiz. I’d never been to Cadiz before, let alone heard of his town, and was surprised to see that “little” meant nearly 90,000 people. When you come from a town of 9,000 that seems anything but “little”! As I arrived to El Puerto for the first time, I remember being secretly thrilled at the location of my new Spanish home away from home. A five minute walk from the ocean, my in-law’s house could not have been better more enticing. But despite the charms of El Puerto, I was aching to see even more of the region of Cadiz. 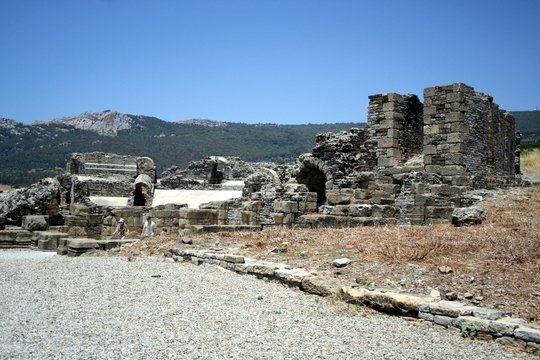 I’d heard about incredible mountains with tiny pueblos blancos (white villages), and the Cadiz beaches that rivaled those of any other European coastline. After a couple of years together, I had become rather embarrassed whenever I’d tell people where Ale was from. 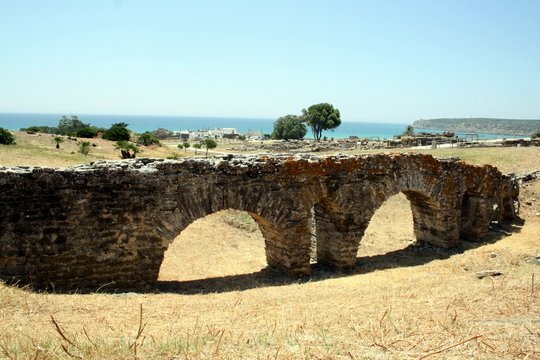 They’d immediately gush on and on about the beautiful beaches of the area while I smiled and nodded– beaches I’d never visited after four years together Spain! So, finally, we rented a car and headed south. It was time to explore the coast of Cadiz, and see if it was really all it had been built up to be. 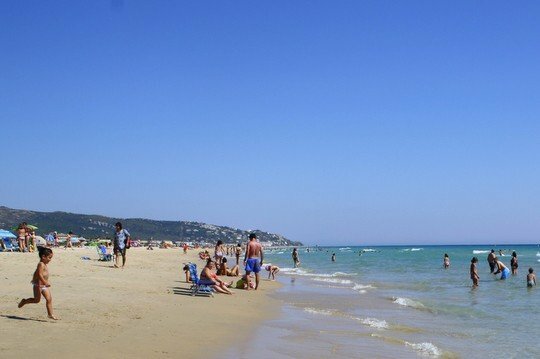 We visited three of the most popular Cadiz beaches: Tarifa, Bolonia, and Zahara de los Atunes, followed by a visit to Cadiz itself. Thanks to free calls from Android, I kept in touch with my family to tell them all about the beauty we’d overlooked on their last visit for our wedding! Hopefully they’ll be able to come back next summer for a better tour of the region. Long stretches of sand and lots of wind– it might not be the most relaxing beach in Cadiz but it is a kite surfer’s haven, and seeing the beach completely covered with colorful kites is an awesome experience. Next summer I’d like to return and stay at the popular Hotel Arte y Vida, which we’ve been told is one of the best places on the coast for a relaxing getaway. 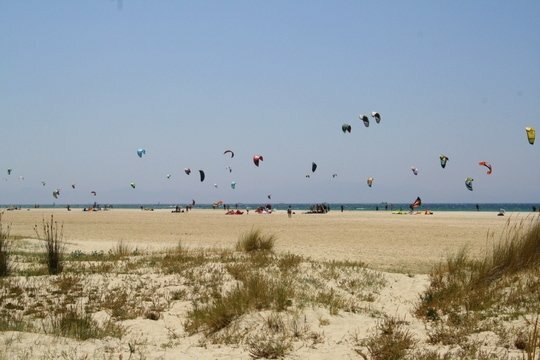 We pulled up to the kite surfers only beach in Tarifa. 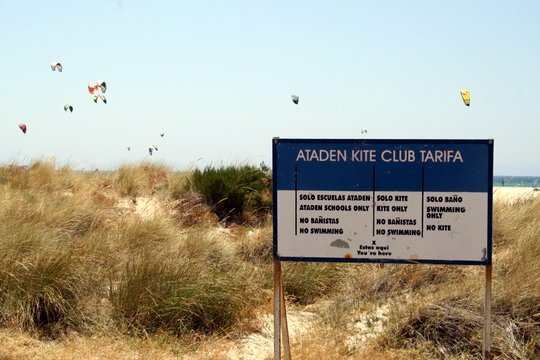 White sand and lots of kites! There were colorful kites flying everywhere! 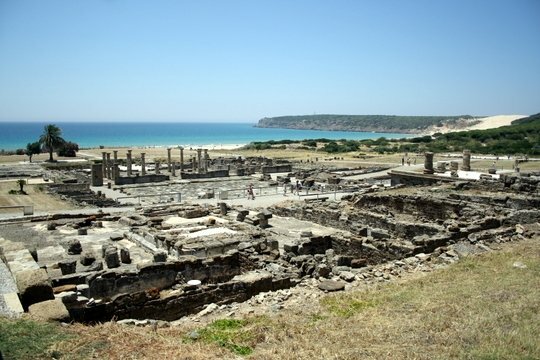 Ruins of an ancient Roman city overlooking an incredible beach with one of the area’s largest sand dunes– how had I not visited Playa Bolonia before? Stepping onto this gorgeous beach made me think about how lucky I am to call Spain my home, a place where tourism hasn’t yet taken over incredible places like this one. We didn’t have time to climb up the dunes, so you can bet I’ll be back next summer! 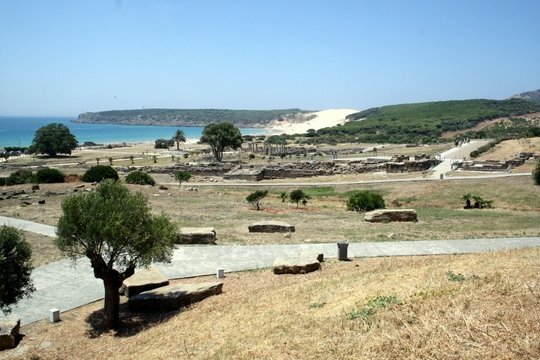 Old Roman ruins and a beautiful beach are more than enough reasons to visit Bolonia. It looks like we’re in the middle of the countryside, but we’re at the beach! The gorgeous view of Playa Bolonia. This was probably my favorite of the beaches we visited. The water was crystal clear and bright blue– I’ve heard people call it the Caribbean of the Atlantic, and I wouldn’t disagree. I’d been hearing about Zahara de los Atunes for such a long time that I assumed it was super touristic and picture perfect– but it wasn’t, which actually made it much more charming for me. I’d like to come back here and spend a few days at the beach while eating fresh tuna for breakfast, lunch, and dinner. The crystal clear waters of Zahara de los Atunes. We ended our route in Cadiz, before going to visit the in-laws in El Puerto. 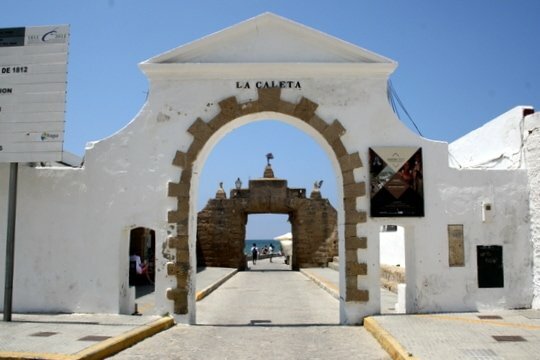 While I’ve been to Cadiz many times before, I’ve never really spent much time at the popular city beach, La Caleta. La Caleta isn’t the most stunning of coastlines, but its unique location between the city’s historic forts coupled with the colorful city folk who spend their summers on its shores makes for a fantastic visit every once and awhile (not to mention it is a very special memory for me–I got engaged there!). The Cadiz coastline– can you see the cathedral on the left? Tiny fishing boats dot the water of this Cadiz city beach. Colorful umbrellas of crowded La Caleta. We happened to do this route in only one and a half days, which I wouldn’t recommend! I wished we could have stayed in each location for a minimum of half a day, but likely longer. I’m so glad I finally took everyone’s advice and got to see the coast of Cadiz– it was well worth it! 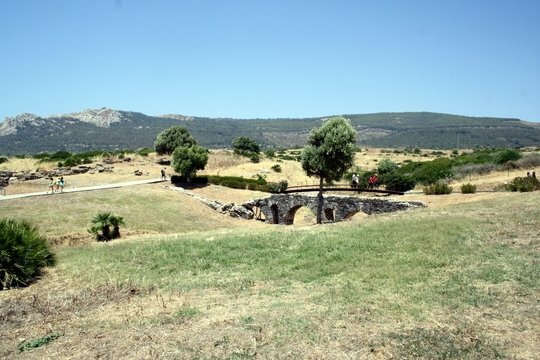 Have you ever been embarrassed to not have visited a place very close to home? I know! We also did do the stretch from Costa del Sol to Algeciras and you’re right– lots of tolls and not much that looked worth stopping. 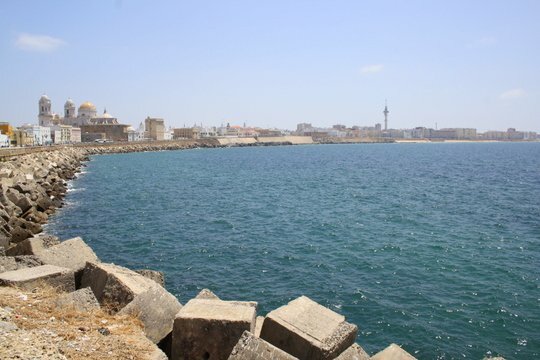 I have such warm memories from visiting Cadiz amd the beaches there. I’m a huge proponent of Los Caños, Zahara and the cheap beach bars in Zahora. 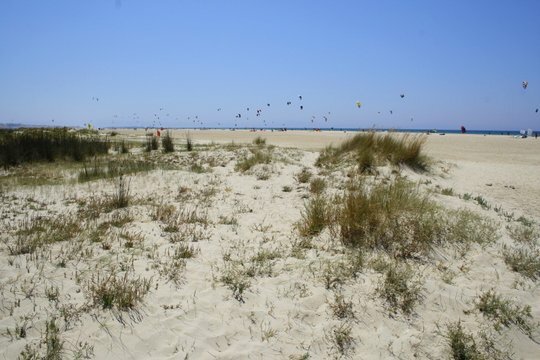 Just made it to Tarifa and Bolonia for the first time next year – Gorgeous! I guess I should also be embarrassed, since I live in El Puerto and haven’t been to any of these beaches! In my defense, it’s really tough to drive to a beach, when Las Redes is a bike ride away. 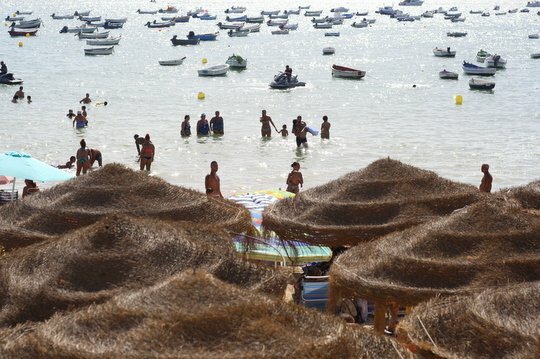 I have actually been to Zahara de los Atunes, but not to hang out on the beach. 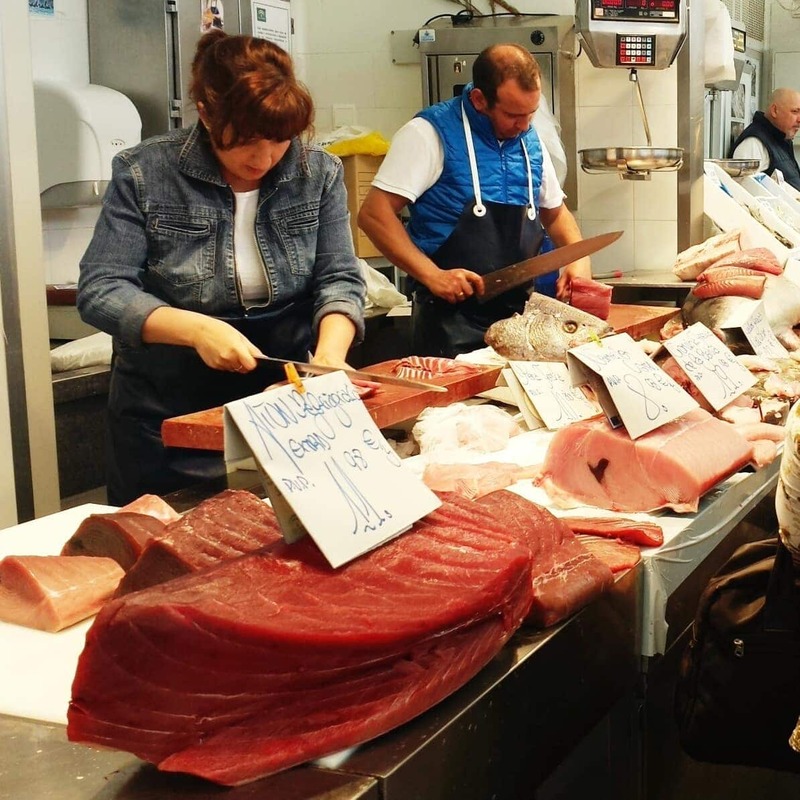 And La Caleta – call me an Americana, but I just wouldn’t be able to deal with the crowds. 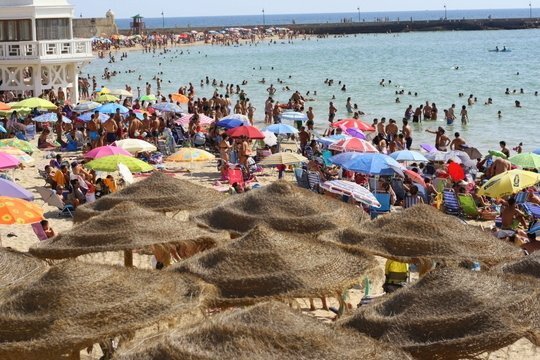 Every time I’ve been to Cadiz when the weather is nice, the beach is solid umbrellas!